Subhakar Rao’s extensive experience in the digital marketing field and his passions for event management as a marketing channel has made him to foray into this field. He employs innovative and cost effective solutions while hosting events and entertainment promotional that delivers excellent results for the clients. His exposure in the international event management show has earned him a deep understanding of what is required to deliver a successful event and entertainment services. A native of the city in which his passion to music is unimaginable, Subhakar Rao has remained a Bangalore resident for his 10 years. 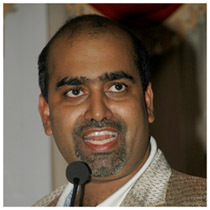 Rao began seriously researching the event management, stage shows, offline and online promotion of DJs from past 5 years. Launched in December 2006 by Subhakar Rao Surapaneni President of Champions Entertainment was founded on a primary goal: creation of event shows, marketing of stage shows and distribution of news and information of DJs, advertising shows through various channels and platforms. Mr.Rao has focused on some of the most vital requirements of our DJs: from giving online exposure to transform their brands presence and marketing efforts by managing social media campaign. Subhakar Rao runs a full- service management company, Champions Entertainment in Bangalore. His company specializes in providing innovative event shows, marketing with stage shows and advertising products and services through various channels and platforms. Since the inception of his company, he has served his clients with dedicated quality and superior service. Being a perfectionist, and with more than ten years of experience in the field of event management and digital marketing – he has served a long list of impressive clients by flawlessly executing many events for them. Champions Entertainment offers 360 degree well –coordinated event management services right from conceptualization to venue selection, lay-out details to artist management and set design to PR exercises. No matter, whatever the requirements of the client - He always ensure to deliver a successful and memorable event. Which business is the client dealing in? What the client is hoping to achieve with hosting the events? Is the expectation of the client realistic and deliverable? Subhakar Rao discuss forthrightly with the client as to what options and strategies are available to employ and what kind of deliverables the client can expect by hosting an event. This clean and honest approach helps the clients to think better and decide on potential threats and risks and what they can expect from Champions Entertainment. Rao has led Champaions entertainment through dynamic growth to rank among the Bangalore’s most successful event management companies with a business strategy focused on a diversified shows of new year party, Christmas party and musical concerts. As President, Subhakar Rao is known for putting a lot of money into charity and “Go Green” campaigns. In 2010, Champaions Entertainment sponsored on Midnight Marathon event. He was responsible for managing some of the activities of the Midnight Marathon. 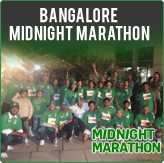 As a sponsor, Mr.Rao make sure the event will be a great experience for the runners & their supporters as Midnight Marathon was the first of its kind in the Bangalore in fact in the world. One of the greatest things about his work is that Subhakar Rao Surapaneni knows quite well about vision. His actions are varied and he mainly likes helping satisfy clients who have special or specific needs. "I like to give them multi services and help them plan," he says. Lots of travel and helping his own employees to be successful are other benefits he enjoys. His actions comprise creating and overseeing the event management's yearly business and marketing plans, as well as managing the sales team. As President of Champions Entertainment Subhakar Rao works to maximize revenue specially his sales team determines advertising placements, orchestrates direct mail campaigns, and conducts sales calls with potential clients.